Fortunately for mankind, planet Earth rests in a region of the solar system where the temperature is not too hot and not too cold, allowing life to flourish for millions of years. Science deems this near perfect area, a Goldie Locks zone, and has begun actively searching to find similar zones throughout the cosmos. It's very intriguing to think of all places in the entire universe, life is here along with imagination and creativity. On top of what some might consider a chance location, humanity is also fortunate enough to be located in this pristine habitable zone partially protected by Jupiter, a large gaseous shield planet known for taking the brunt of asteroids bound toward Earth. These two very important features of our solar system have ensured our existence in the universe since the dawn of our creation. The sun burns just bright enough to keep us warm, and the moon moves just enough to keep the oceans mixing. Life could not be reality as we know it without these conditions, further justifying we are not simply here by coincidence, and that resulting consciousness is indeed a gift. Until life is found elsewhere in the Universe, we must accept the fact that life is only known to be associated with Earth. This we can confirm beyond any shadow of a doubt, but it also doesn't mean life can't be found outside of our planet. Many people question whether or not life exists anywhere else in the cosmos, a definitely profound curiosity of the human condition. Are we really alone on this planet? 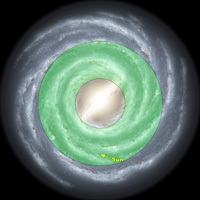 Since we know life exists on Earth maybe because we're privileged to be located in a habitable zone, that we have our very own cosmic shields with the sun to warm us up; Yet living on Earth's surface sometimes is perceived as a much more hostile place to be. Life is not an easy existence by any means. Over millions of years humans steadily climbed to the top of a global food chain by perseverance, ingenuity, hard work, and a little luck. The road to where mankind stands currently was very rough, even when genetic evolutionary traits pushed in our favor. At one point, ancient man learned it's easier and more efficient for survival to hunt in packs, perhaps as they once seen animals do.